TALLAHASSEE, Fla. (AP) – After years of losing to Dad, Clemson’s Tommy Bowden is getting the best of college football’s most famous family feud. James Davis plunged into the end zone from a yard out with 8 seconds left to give Clemson a 27-20 victory over No. 9 Florida State, Tommy’s third win in the last four years over Bobby Bowden. Clemson had not won in Tallahassee in 17 years. And momentum changed dramatically at the end when replay officials overruled a field official’s decision on a fumble that had awarded the ball to Florida State. The sophomore tailback got 67 of his 87 yards on the final drive, including a 47-yard ramble that took the ball to Florida State’s 4. “We caught them a couple of times not getting lined up and broke some big plays,” Tommy Bowden said. Two plays later he was in from a yard out for his second touchdown of the game. 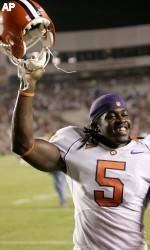 Clemson had not won at Florida State since 1989 when Terry Allen led the Tigers to a 34-23 victory, three years before the Seminoles joined the ACC. “We played good enough to win the game up until the last drive,” Bobby Bowden said. Clemson (2-1, 1-1 Atlantic Coast Conference) won despite having two kicks blocked and returned for points by Florida State’s Tony Carter. He ran back a blocked field-goal attempt for a touchdown and another for two points on a blocked extra point – the first returned PAT for points in Florida State’s football history. Florida State led just once, 9-6, after Carter’s 69-yard run with a blocked field goal try. He’d raced 80 yards with the blocked extra point after Clemson opened the scoring on Davis’ 8-yard run. Florida State (2-1, 1-1) struggled again offensively. It’s first offensive touchdown came on Joe Surratt’s 1-yard run with 10:27 left the game and Drew Weatherford hit Chris Davis for the 2-point conversion to tie the game 20-20. Florida State didn’t score in the first half for the third straight game, managing its first points late in the third quarter on Gary Cismesia’s 25-yard field goal that trimmed Clemson ‘s lead to 20-12. Will Proctor’s 20-yard TD run put the Tigers up by 11. Clemson grabbed a 14-9 lead with 23 seconds left in the half on Proctor’s 19-yard scoring pass to Chansi Stuckey, who caught 11 passes for 156 yards and two touchdowns in Clemson’s 35-14 win over the Seminoles last year. The Tigers were successful on a 2-point try when Proctor again hit Stuckey. Florida State, seemingly confused on offense at the beginning of the game, was out of timeouts less than nine minutes into the game, although one came in advance of a Clemson punt. The Seminoles had only 89 yards offense in the first half and finished with 204. Weatherford was 11 of 19 passing for 102 yards and didn’t once try wideout Greg Carr, who led the league a year ago in touchdown catches.